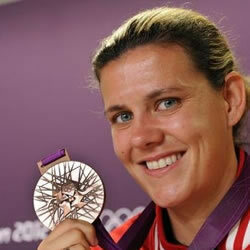 Christine Sinclair is widely recognized as the greatest soccer player to ever come out of Canada. She has spent the last 12 years with the Canadian team, participating in three FIFA World Cups (2003, 2007, 2011) and two Olympic Games. At the London 2012 Summer Games, she scored a hat-trick in a 4-3 extra-time loss in the semifinal match against the USA. She finished as the tournament's top scorer with six goals and led the Canadian women's national soccer team to a bronze medal with a 1-0 win against France. She broke the record of most goals scored in the Olympics for women's soccer and won the gold boot of the competition; scoring 2 goals against South Africa, 1 against Great Britain, and 3 against the USA. Her remarkable effort as team captain and her performance in the semifinal earned her the honour of serving as Canada's flag-bearer in the closing ceremony. At the age of 29, she is the all-time leader in goals scored for the Canadian women's team. As of September 1, 2012 she is third in the world in all-time international goals scored by a female, with 143. Christine is the reigning and seven-time Soccer Canada Player of the Year. Five times she has been nominated as the FIFA World Player of the Year. She is also the recipient of a Diamond Jubilee Medal. Christine hails from Burnaby, B.C., and played college soccer at the University of Portland, where she set an all-time Division I goal-scoring record with 39 goals, was named "Academic All-American of the Year" by ESPN The Magazine, and won The 2005-2006 Honda-Broderick Cup as the collegiate "Woman Athlete of the Year." Christine tells the inspiring story of her rise to soccer success. She describes the team work, passion, and competitive nature that she needed to rise to the top, as well as the obstacles she has had to overcome in her sport.